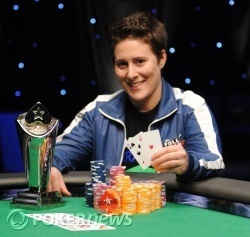 Vanessa Selbst - Champion of NAPT Mohegan Sun! 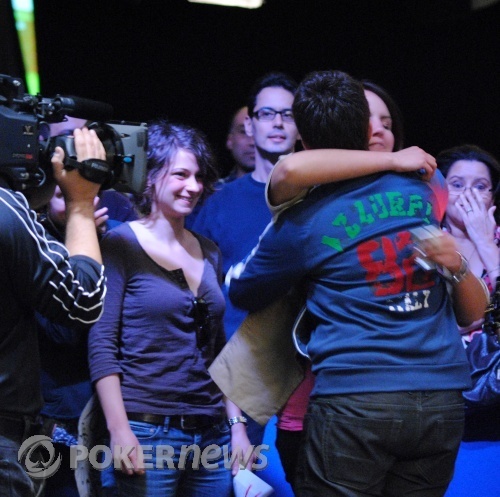 Over the past five days we witnessed a dominating performance from Vanessa Selbst. She started out strong on Day 1 and never relented. By the time today's final table started, she had amassed more than 4.5 million chips, just behind Mike Beasley's 4.9 million chips. Each player played strong, aggressive poker at today's final table, but Selbst also had to the good fortune of flopping some big hands in spots where her shorter-stacked opponents were forced to put their chips in. She even ran well in her flips, notably beating out Derek Raymond's ace-ten with pocket sixes for a pot worth roughly 5 million of the 21 million total chips. At the end, it was the two chip leaders, Selbst and Beasley, to battle it out heads-up for the championship. Selbst had a 7-to-1 chip lead at that point. It didn't take her long to finish things off and take home the $750,000 first prize. 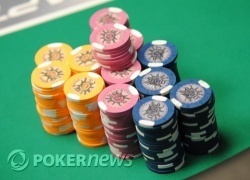 That ends our coverage of the 2010 PokerStars.net NAPT Mohegan Sun Main Event, but we're not done here just yet. Tomorrow we'll bring you coverage of Day 1 of the $25,000 High Rollers Bounty Shootout. That's sure to be a field loaded with the top talent in poker. You won't want to miss it! Two hands ended the game for Mike Beasley. On a flop of , Mike Beasley led out for 1,000,000. Vanessa Selbst moved all in, putting Beasley to a decision for the rest of his chips -- about another 1.2 million. Beasley tanked two minutes. While Beasley was tanking, Selbst turned to Neil Johnson and said, "We're heads-up in the tournament so now I can talk, yeah?" She was referring to an incident that happened yesterday right before dinner break. Beasley eventually folded. The next hand, he moved all in but Selbst passed. The hand after that, they got it in pre-flop. Selbst tabled to Beasley's . The flop came down , improving neither player. Selbst's ace was still in the lead. Beasley asked for a turn card that would at least give a decent sweat -- something like a jack. He didn't get it with the turn. "Queen of diamonds," said David Fox from the rail. It would have to be a queen or a ten for Beasley to stave off elimination, but the river came to pair Selbst and send Beasley to the rail. On the first hand of heads-up play, Mike Beasley completed for 100,000 in front of Vanessa Selbst, who raised to 250,000. 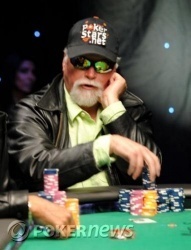 Beasley called, then folded for another 250,000 on a flop of . The next hand Selbst opened for 225,000. Beasley folded. Selbst showed pocket tens. "You're supposed to shove with A-2 there," she joked. The two players are on a short break before heads-up play begins. The clock has been paused with just over 20 minutes left in Level 29. Mike Woods raised to 310,000 from the button. Vanessa Selbst was in the small blind and called after a moment. Mike Beasley folded from the big blind. The flop came down and Selbst checked. Woods fired 700,000. Selbst studied and then raised to 1.8 million. It was now Woods' turn to study in the tank and he did just that. Woods moved all in for 3,425,000 and Selbst snapped him off. Selsbt tabled the for a set of eights and Woods had the for top pair and a straight draw. The turn brought the and missed Woods, keeping Selbst in the lead. The river card was the and although he made two pair, Woods couldn't beat the set of Selbst and was eliminated in third place for $240,000. Ship another 1.1 million chips to Vanessa Selbst. She is being relentlessly aggressive now. 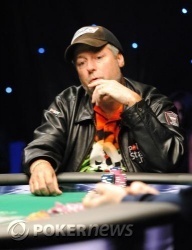 On a limped flop of , Mike Beasley led out for 205,000. Selbst raised 375,000 on top before Beasley re-raised another 1.1 million. Selbst asked Beasley how much more he was playing (3.1 million) and then moved all in. Beasley folded. Mike Beasley called on the button, Mike Woods completed his small blind, and Vanessa Selbst checked her option. All three players saw a flop of . It was checked to Beasley and he bet 275,000. Woods folded and Selbst raised it to 650,000. That didn't stop Beasley, re-raising to 1.1 million. Selbst asked for a count and when told that Beasley had about 3.3 million behind, she moved all in. Beasley gave it up pretty quickly and Selbst took down the pot. Vanessa Selbst opened the small blind to 275,000. Mike Beasley called from the big blind to a flop of . Selbst checked and called a bet of 325,000 from Beasley. Both players checked the turn and the river. Beasley showed for a pair of tens; Selbst showed for a pair of aces. "I should have bet the turn," said Selbst after the hand. "If I had know you were going to check the turn, I would have." Mike Beasley folded his button and Mike Woods completed from the small blind. Vanessa Selbst checked her option and the flop came down . Woods led out 200,000 and Selbst raised an additional 275,000. Woods called and both checked the turn card, leading to the river card. Woods checked and Selbst bet 725,000. Woods called and mucked when Selbst tabled for two pair, winning the pot.